For many, it’s one of the most important things to remember to bring: The alcohol. Six packs, glasses of wine, or cocktails are the perfect way to unwind by the grill or campfire after a long day of RVing. The rules with alcohol and RVs can be strange because an RV is both temporary housing and a vehicle. Let’s cut through some of the cloudiness by discussing how to RV with alcohol. Some people will grab a six-pack when they get to the campsite. Some will stock the fridge with wine before they even hit the road. Regardless of how you store alcohol in your RV, there are some rules to follow while on the road with alcohol. Alcohol should never be opened in a moving RV or RV that is not at its site. It’s understandable that your passenger may want a cold one during a long road trip, open container laws are the same in RVs as they are in regular automobiles. Any open container inside of a moving RV or an RV that is not parked at a site is considered an illegal open container. Drivers can be cited by police for open containers even if they haven’t touched a drop. In a worst-case scenario, a passenger could also be cited for open container, even if they are not driving. It is recommended that you don’t even carry alcohol in the RV until you are at your site. Though it is not illegal in itself, any alcohol within a moving vehicle can be suspicious and might have a police officer asking you more questions. Never under any circumstances should the driver of the RV consume alcohol. Privately owned campgrounds can make their own rules when it comes to alcohol. It is always best to ask or check your RV park’s alcohol policy. If a private campground says that no alcohol is allowed in their park, it doesn’t matter what local or state law says, no alcohol is allowed in the park. Public campgrounds also have their own rules when it comes to alcohol. Some parks allow whatever alcohol you want to bring, some may only allow alcohol of a certain alcohol-by-volume, others may forbid it altogether. Again, what the park says is the rule, no matter the local laws. Not every part of the United States allows alcohol. There are still many townships, counties, and other jurisdictions that remain completely dry. Consuming alcohol within these areas is illegal and even transporting alcohol through them could get you in trouble. You likely won’t be hauled to jail for transporting alcohol in a dry area, but you could be hit with a fine. Certain parts of the United States such as the Deep South and mountain west are more likely to have dry areas so make sure you aren’t doing anything illegal before driving through them. Most parks and grounds do allow alcohol, but they do not allow intoxication or over-indulgence. Avoid overindulging at the RV park at all times or you could find yourself kicked out of the park without a refund or even written up by local law enforcement for public intoxication or disturbing the peace. When you’re sitting around the campfire, you are sitting in public space, so treat it as such and enjoy alcohol responsibly. You may want to bring your favorite brand of suds when driving across the border to Canada and Mexico or when returning to the states and actually, it may be okay. You will need to follow all proper customs procedures and regulations that differ depending on where you’re entering and where you’re entering from. You won’t be able to transport an entire keg of Canadian microbrew down to the states but there is some wiggle room when it comes to alcohol, customers, and different containment. If you are ever curious, just ask! Better to ask than have your goods snatched by customs. Alcohol is a respectable beverage if you treat it that way. 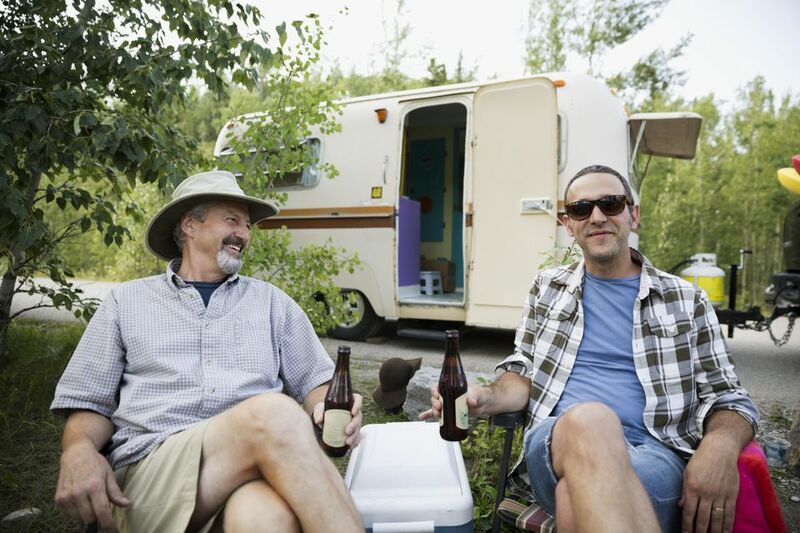 Be smart about your RV and alcohol to have a safe and fun trip while also enjoying a great adult beverage. If anything bears repeating, though, it’s this: Never drink and drive.